You might get this impression when seeing how much effort and attention marketers devote to social media and website optimization strategies. But don’t be misled – your inbox is jam-packed with good reason. The email channel is still the dominant one in the digital marketing ecosystem. A survey by Ascend2 and Research Partners reveals that 79% of marketers report that the performance of email marketing is growing. Email is alive and kicking – when it comes to customer acquisition, this channel is 40 times better than Twitter and Facebook combined according to research by McKinsey. Ok, so you know that email marketing works. And you’ve probably read all sorts of tricks and tips on how to do it, but maybe you’re still not getting results. The key is to stay alert and start tracking your email marketing campaigns. This post will give you a look behind the scenes of this process to get you on the right track with your game plan. We’ll present the essential ingredients of your campaign tactics step-by-step. Any initiative your marketing team undertakes requires defined goals. If you want to run an effective email campaign, you need to know what its purpose is and what you wish to achieve. Maybe it’s increasing engagement, acquiring new subscribers, or nurturing existing ones. The goals you establish help you define your entire strategy. Email marketing analytics will measure if you have achieved those goals or not. So, your campaign is running at full throttle, but how can you measure if it’s getting the job done? The answer lies in creating well-tagged URL links. These should tell you about traffic sources, how traffic gets to you, and ultimately why it reaches you. But let’s get back to the basics. UTM codes are parameters you add to the end of your links to collect data for specific campaigns, including email campaigns. You can create these links manually, and in this case a URL builder tool comes in really handy. Otherwise, you can do it automatically through your platform. The method you choose depends on the software, but the meaning behind the whole concept of tagging stays the same. Basically, UTMs are a must for email marketing tracking. 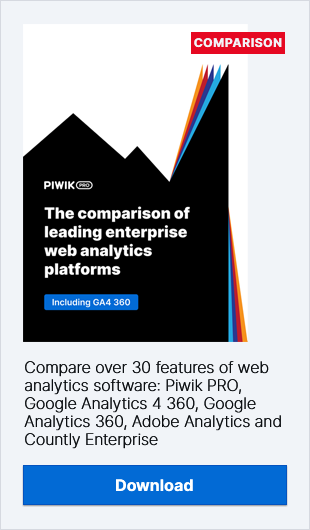 Just a reminder: utm_ is a Google Analytics standard code, but you may also encounter pk_ parameters, which are used by Piwik PRO software. Whatever solution you choose, you can always safely convert one into another with the Piwik PRO UTM Converter. These variables allow you to track different bits of information about your email campaigns. Once you complete the parameters fields with details of your campaigns, you will be tracing all the results generated by a particular email. If you use analytics tools and set your goals there, whether it’s purchases, sign-ups for a demo, or e-book downloads, you see precisely what results a particular email brings. And for the sake of good email campaign tracking practices, all these clickable elements should be tagged. That was the first phase of our campaign, and since we were promoting only one event all the elements in the message had exactly the same link. Putting UTM into use for emails allows you to collect precise and actionable data with your analytics software. That’s crucial for making informed decisions when you devise your marketing strategy. But that’s not all! Once you tag all your links, you can take it one step further and apply URL parameters to set precise triggering in tag manager. There’s an easy way to do it. We’ll take an example from our campaign we’ve already mentioned. You can choose what kind of event you need to fire and under what conditions it should be done. In our case that would be when someone comes from a URL address dedicated to the GDPR webinar promotion. Just open trigger settings in a tag manager, pick the desirable event, set precise conditions from the drop-down lists, and enter the proper parameters. Relevance. One of the key factors sparking engagement by your email recipients and the cornerstone in your email creating process. It’s an absolute must-have. Customers opt in for subscriptions if the message is relevant to them. More than one-third of respondents in a HubSpot survey expressed this opinion. We can also learn from this poll that segmentation is your ally when trying to improve CTR. Companies with only one list have an average 7.3% CTR, while those with 1-6 lists in their database see a click-through rate of 8.3%. So, what’s the way to create engaging emails? The answer lies in cutting through the noise and reaching the desired audience by using segmentation. By segmenting your list, you ensure that your message appeals to your recipients’ real interests. The abundance of data you gather gives you a myriad of possibilities for dividing your audience. As you progress to more granular segmentation, you should consider individual email recipients. In other words, take into account what points of their customer journey they are at. Needless to say, at various stages of the funnel your customers have different needs and expectations. Keeping that in mind, you won’t make the mistake of promoting your blog posts to visitors who have already downloaded your free guide, or offering a discount on a product to people who have just bought it. In addition, you can use segmentation to fix your sender reputation. That’s an important asset and a long-term gain. We’ve already mentioned bounce rate, but this isn’t the only issue here. It’s also a matter of complaint and unsubscribe rates, which you can reduce if the right people receive the right content. That’s why it should be a priority to send emails only to those who truly want to find them in their inboxes. Nowadays, marketers and analysts have a wealth of data at their fingertips and can really get to know their customers. What’s more, email marketing analytics pave the way to reaching business goals. KPIs for your campaigns should be tied to these goals. However, in order to reach them, you should focus on the metrics you’ll need to track and leverage. Metrics are a key element of every business strategy because they facilitate informed decisions. The trick is to know which are crucial for your particular objectives and then include them in your reporting. Your business is unique, but there are some metrics considered the bread and butter of every email marketing campaign. Let’s dive into the details. Click-Through Rate. CTR is simply the percentage of people who click on any link you’ve put into your email. It allows you to calculate how well each email is performing. Email marketers should track this metric as it provides them with valuable information on how many recipients on their list are interested in their brand or offer. Conversion Rate. This is the percentage of people who clicked on a link included in your email and converted on your offer. You define conversion with a specific goal in mind, whether it’s downloading an ebook, signing up for a webinar, or making a purchase. Measuring the conversion rate requires integrating your email platform with web analytics and including tracking URLs in your emails. We’ll cover this later on. List Growth Rate. This metric tells you how fast your email list is growing. It takes into account the number of new subscribers minus unsubscribers and email complaints. Bear in mind that losing subscribers is quite natural. Fortunately, metrics allows you to track your list’s growth and losses so you can keep it at a healthy size. Bounce Rate. That’s the percentage of sent emails that don’t actually reach recipients. It may be due to incorrect or deleted email addresses in the case of hard bounces, or just a temporary issues caused by a full inbox or slow servers. Regardless of the bounce type, such addresses should be removed from your list as they simply won’t work. More than that, a high rate affects your sender reputation, which is why you need to keep your list clean and up-to-date. Sharing/Forwarding Rate. The metrics tells you how many people share or forward the content of your email. At a deeper level it reveals what kind of message or offer resonates best with your recipients and how you can acquire new contacts. That information should serve as inspiration for future strategies. Unsubscribe Rate. The percentage of people who click the unsubscribe link in your email. This rate provides you with valuable information you need to consider. For instance, your message wasn’t treated like spam: it might just not be engaging enough for your recipients. Keep an eye on unsubscribing trends, especially when introducing some tweaks into campaigns. This could be related to segmentation, sending schedules, or redesigning your templates. Cross-referencing all these KPIs in your reports with engagement and acquisition trends lets you use your time and effort more efficiently. You’ll be able to see what’s working and keep following this path, and any issues you find can be fixed on the fly. That leaves more room for creating tailored, relevant, and precisely targeted content that speaks to your email recipients. To create extensive reports and track the performance of your campaigns you need a robust tool stack. Whether it’s conversion insights or data on clicks and impressions you need, web analytics supported with CRM and a tag manager will get the job done. If you’re looking for complex data visualization for reports of merged data you can also consider tools like Tableau or Looker. We know there’s no one-size-fits-all tactic for tracking email marketing because every company has its own specific business goals and operating tactics. And we know we have focused on just the main points of a broad and complex subject. However, we hope that this post has given you a bigger picture of the strategy itself and provided some helpful tips you can apply right away. If you have some questions you’d like a fast answer to, reach out to us and we’ll be glad to help.